The new Air Pots are ideal for growing rooted seedlings or clones as the improved root development creates an extremely hardy young plant that can be effectively transplanted to larger pots when needed. Whether your growing in coco, soil or hydro the Air Pot allows your plants to develop a remarkable root system that cannot be matched in any other pots. The Air Pot will enhance the quality of the root systems of plants. Made of recycled HDPE, the Air-Pot is circular in shape with a perforated sidewall, There are no flat surfaces to deflect roots and start the spiralling process. Improves oxygenation and nutrient uptake. Reduces transplant shock, Faster growth rates, Healthier plants and Higher yields. 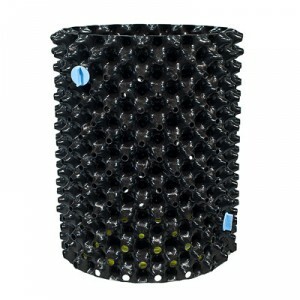 Air Pots are made of very tough, 100% recycled plastic and are delivered flat-packed. They are straightforward to assemble and disassemble to allow for easy potting up and will last for years.